CAPTION: Suisun, California - Suisun Valley Farm Center, owned by three hundred rural residents in Suisun and Green Valleys. 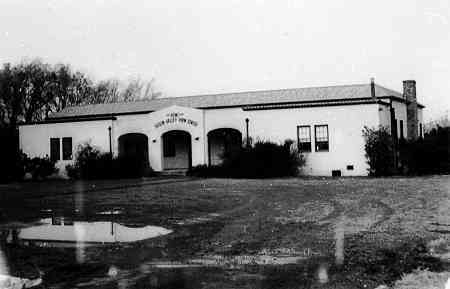 The Center was organized in 1916 to share in the scientific agricultural knowledge of the University of California Extension Service and to have an organized group to speak on farm problems. W.J. Morrison, Fred A. Chadbourne and W.S. Davission, all descendents of pioneers who early discovered the valley soils were among the best in the State, built the hall. Funds had been accumulated from social gatherings held in the loft of Joe Chadbourne's barn where a dance floor was installed. The old Bank of Suisun aided in the financing. In spite of the Depression of the 1930's the debt was cleared and the valley farmers own their private meeting place today. Photos by Gelenn Richardson.